I came across an great essay by John J. Miller of Hillsdale College about Football, it’s early violent years and the impact that Theodore Roosevelt had on the game we enjoy today. An interesting question is what role does risk and the potential for injury play in making us a stronger people and does a life a guaranteed safety make us weaker. As a Programmer I found this article very interesting. But one of the nuances of this finding, that the article does not explore, is that if we agree that Writing Code is the new literacy … is being “Tech Savvy” the new illiteracy? For many years we’ve known that in order to succeed in the modern economy an individual needed to know how to use a computer … they had to be what was commonly called “Tech Savvy”. When this term became common place many years ago, it assumed that knowing how to use a computer is something that not everyone did, or could. It may have been because of environment, access to a computers, training, interest, or because a computer was not easy to use. Therefore the potential employee that knew how to use a computer was set apart … they were “Tech Savvy”. I argue that what was once “Tech Savvy” is no longer good enough, because the computers (phones and tablets) have been designed to hide their technical complexity behind very simple interfaces. In fact every product in Apple’s entire product line is designed to make using it simple, requiring less and less savviness to use with each revision. Has the movement toward improved UI design in apps created less knowledgeable users? My oldest son Aiden is 11. He can to ANYTHING with an iPod, iPhone or iPad. He does homework on it, he communicates with his friends through Instagram and posts videos out to his network. He is by all definitions a true Millennial. He has never known a world without the internet. Don’t know something … ask Google, but even now that’s too much work because it requires typing … just ask Siri. And necessarily repeat the question over and over again until Siri finally understands what you are trying to say. It really would be easier to type in the question. These tools are designed so that everyone can do all of these things; today Aiden’s technical abilities are nothing special. The high degree of designed simplicity and integration have fooled people into believing they know how to use technology. They are no longer using the technology they are using a developers vision of the technology with no ability to change or modify it. Ask these iSavants how the technology works and you’ll hear everything from “I don’t know” to “Magic”. It used to be that USING technology required you to UNDERSTAND technology … but that dependency is no longer true. I can only imagine how insulated many people will be from the process of computing in the future. In fact there was an incredible short story written in 1909 called The Machine Stops that predicted mankind’s dependence on machines and simultaneous inability to understand them. It is an amazing read. Programming IS the skill of the 21st century, because it provides a level of technical understanding that very few other skills can. It will tell you how computers work at the most basic and lowest level, how they communicate, how to modify them and how to create entirely new computer services. But our isolation from the technology is going create fewer and fewer people who have this kind of knowledge and skill. But while we will know less of it we will become more dependent on it as everything with a microchip in it will require someone to program it. I’m gonna go see if I can find a computer programming camp for Aiden this Summer, and dust off my old Java books. Read this blog long enough and you’ll hopefully see my given talent. No it’s not the writing; unless you happen think that’s my talent …. then if so, you have my undying gratitude for your seemingly low standards. It’s also not my uncanny ability to identify actors just by their voices which happens to be my lame superpower. No, “I see patterns”. I just whispered that like the famous line from Sixth Sense, and the woman sitting next to me in the restaurant is now staring at me wondering “what’s wrong with that guy”. I recognize patterns in many structured and unstructured environments. It’s kinda like being the opposite of Jeff Goldblum’s character in Jurassic Park. Where Dr. Ian Malcom sees chaos … I see patterns. This “talent” often helps me break the log jam on problems by thinking of a different problem with an analogous pattern to one I’m facing and it can give me a direction to start heading in. Let me give you an example, I was watching my youngest Benji play baseball last week. Benji really likes playing baseball, he loves going to the field, getting his uniform on (although sometimes it can be hard to find every piece), he loves running the bases and being on the field and always sliding at home. There is nothing he doesn’t like about the game … even when his team loses. And this season … his team has lost … not that’s too weak a term. They have been repeatedly destroyed. And this game was no different. In fact by the 4th inning they are losing 20 – 0. They would have stopped the game due to the mercy rule but in this case Benji’s team hadn’t even made it through the entire batting order yet, so they continued the game just so each player would get once chance to bat. Losing hurts, it can break down your will to play, to coach and to try. I know because I lost a lot in my sporting career. I played three sports in high school Football, Wrestling and Track and wasn’t particularly good at any of them. I’ve seen the look on a players face when they are just going through the motions (just look at the current NY Giants). And I could see it that night on the baseball fields but not in the face of the players, I could see it in their coaches. Benji’s coaches are broken men. Late in the game, Ben was playing Third and I was a little worried because the other team could really smack the ball (did I mention the score was 20 – 0) and I was a little afraid that his fielding skills wouldn’t be up to the task of protecting himself, let alone fielding the ball cleanly. So I yelled and reminded him to be “Baseball Ready” as the first batter came up. The first batter hit a ball passed the second baseman and he eventually ended up at second. The next batter steps up and hits the ball toward third. Ben leans to the left and cleanly fields the ball and as he looks up the unforced runner from second is standing next to him, inches away, so what does Ben do …. (despite the cries of “Tag Him”) he turns and darts in the other direction so he can tag third base. By this time the base running Coach has send his base runner back to second and he is safe. Now this is a developmental season, the fall always is. It doesn’t have the over the top pressure that is so prevalent of the spring season. So I expected Ben’s Coach who was less then 10 yards behind him to explain that tagging a runner also get’s him out. I wasn’t expecting him to break into an extended lesson on forced and unforced base running, but they needed to say something so Ben could understand why the boy he saw running to third wasn’t out. But there was nothing. Nothing except the head coach for the other team yelling out to our coach that “someone needs to fire that third baseman.” Ben didn’t hear it … and he was “joking” … but I heard it. After the game when coach had given his post game message to the boys and as all the other kids and parents we leaving. I took Ben back out on the field and placed him right back in his third base position. We then talked about how he could have tagged the boy to get him out and even introduced the forced/unforced runner concept to him. I took him out on the field and placed him back in that position so that when I gave him new information to use he could place it in the proper context. If the Coach had tried to talk about the same concept at the next practice three days later the opportunity to provide the best learning, or feedback, would have already been lost. Whether it sticks or not may be a different story all together, but thinking about this got me thinking about how we deliver feedback as managers to members of our teams at work(Pattern). The same rule applies when we are working with our teams in business. For feedback to be effective it has to be timely. No one wakes up in the morning and says “man I can’t wait to deliver some hard hitting negative feedback today” … it’s got to be the most unpleasant part of any manager’s job. So naturally it’s something that many managers drag out instead of addressing immediately. But by waiting you are not helping the employee and you are not doing your job. Feedback, like bad news, doesn’t get better with age. I’ve even seen some managers wait so long to deliver negative feedback that they admitted to me they can’t even discuss the issue with the employee. When that happens those Managers look exactly like those broken men who coach Ben’s baseball team, they look as though they are just going through the motions. Wait too long and your team will start turning on you … they can see the problems and they also see that you aren’t doing anything to address them. Believe me, I’m speaking from personal experience here. They may start hollering for someone to be fired … and you may find you are the Third Baseman. It may not be your favorite aspect of being a Manager but you have to say something. Disclaimer: I am not writing this to be critical of Benji’s coaches, this was simply an observation I made. I’ve been a youth league basketball and soccer coach as well as Cub Scout Leader and I know that incredible amount of thankless work these volunteers do. I am very appreciative of all of my boys’ coaches, as the bulk of my free time is spent leading Cub Scouts and there is no way I could do both. I actually like this head coach because prior to each game he gets all the players together in the outfield, everyone get’s down on one knee and they say the Lord’s Prayer together, he’s a good guy. For no other reason the technical curiosity I’ve become very interested in QR Codes over the past few months. And that is perhaps the Geekiest statement I have ever written. It was just a couple of years ago that Quick Response or QR Code first gained popularity while at the same time Microsoft was trying to create a proprietary version called Microsoft Tags. There was some debate in the darkest of geeks basements, typically covered in Star Trek Voyager posters, as to whether Tags or QR Codes would be come the standard way of bridging the physical and virtual worlds. And the technical folks among us started including them in the signature blocks or our email and on our business cards. Presumably because entering the information from the card or email into one’s contact folder was too onerous a task to be done manually. But after this initial flutter of activity Microsoft Tags went by the way side and the use of QR Codes slowed. I was in New Jersey waiting for a movie outside of a pet store. This modern version of the old classic had several very cute puppies in the window. To allow passers by to learn more about the animals and their breed the store had posted QR Codes on the outside glass. When you scanned the code with your smart phone it took you to a web page which had information about the puppy including many of the common questions that patrons ask. It was a pretty smart way to leverage the data they had in a way that helped encourage people to learn more about the “product” the store was selling. Later in the Summer I was on my annual pilgrimage to South Carolina to buy fireworks (the good kind) for the 4th of July. The fireworks store has monitors up in all the aisles which play videos of each of the fireworks in that aisle going off. This allows us wannabe pyros to see the effects of the firework to know if we want to purchase it. The problem is you have to wait for several minutes to see the firework you are interested in demonstrated on the video. But this store created QR Codes for each of their fireworks which was posted next to their price on the shelf. When you scanned the QR Code it took you to Youtube where you could see the video for that firework on your cellphone. Then you could decide whether you wanted to purchase “Hillbilly Armor” for your party. Which you do because it rocks, just like Hillbilly Armor should. In fact there was even a tattoo shop that used a QR Code to search for new artists. The published a QR Code with no description which needed to be filled in exactly to work. When any would be artist completed the QR code and scanned it, they found the real ad asking them to apply as a Tattoo artist. Pretty cool. What other neat uses of QR Codes have you found? Have you seen a Credit Union or Bank using them for a interesting application? It’s beginning to look like retailers have found the right way to use them to share information with consumers and I think we will definitely see more of them. I suppose my absence from writing, and the subsequent abandonment of the C25K series could have lead a reader to believe that perhaps I’d given up on my pursuit of completing a 5k race; it would be logical to assume so. But my absence was not cause by the abandonment of the goal but instead on the need to more carefully focus on it; which allowed me to train and prepare in a more targeted way. Ultimately I completed a 5k, but of course not the one I’d originally intended. As I previously wrote, I was in the final stages of preparing for a 5K in April when my ankle exploded in pain through the recurrence of gout just 6 days before race day. Ultimately I was unable to compete in the schedule race and instead was forced to admit that it was time to seek medical assistance for this dreadfully painful condition. I was despondent that I could not compete in the race that I had trained for. By consulting my doctor, he placed me on a new daily medication regimen that once stabilized literally provided a stronger foundation to build my running on top of. Once I started moving I needed a target and with my friend Douglas Stewart identified the Triangle Komen Race for the Cure on June 8th. And as we are both inherently social animals we set off to create two teams, one from my company and one from his. The friends who joined me on the race did a tremendous job motivating my training as I could see they were pouring themselves into preparing for the race, many of these folks were also preparing for their first 5k. They were inspiring. The added requirement of raising money for Breast Cancer Research allowed us to share the journey with our family, friends and colleagues who ultimately tallied more than $2000 for the charity. It just goes to show how very generous all of our friends and family are. Wonderful people. 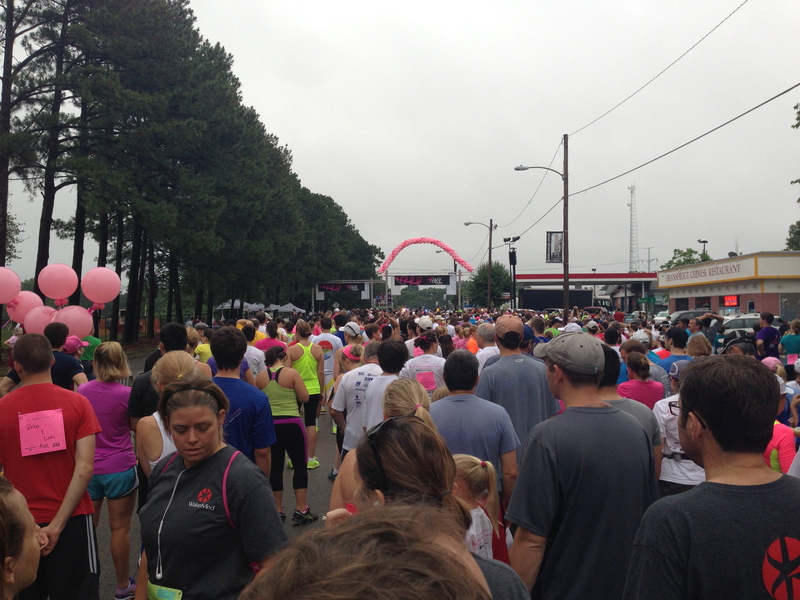 The Komen Race for the Cure is a tremendous confluence of purposes and I don’t know that appreciated that until I arrived at Meredith College on race day. You have people who using the race to memorialize someone whom they loved and lost to this disease, you have survivors who are identified for all to see in bright pink t-shirts who are celebrating their victory, you have people who like myself were using the race as a type of yardstick against which I’d be measuring myself and you have people who participate out of a larger sense of community. They would feel left out if they didn’t participate regardless of the cause. Regardless of the motivation at 7AM nearly two thousand of us lined up to the run the competitive 5K. After the gunshot to start the event, I ran the first mile far faster than I had trained and ultimately out ran my endurance. The hills on the second half of the course further weighed on legs, but repeatedly when I wanted to slow down there would be a gaggle of well wishers standing on the sidewalks encouraging all of the runners to press on and finish the race, much like I imagine the friends who rise to encourage a woman who is diagnosed with breast cancer. The temperature was not extreme but the air was thick with humidity. It sapped sweat from my pours. And just before the finish line I had the overwhelming desire to throw up having pushed myself through the hills and humidity, but with encouragement I finished. I hoped that I could run the race in 36 minutes or less, but ultimately ran it in 39.08 (a personal best according to my Nike Plus running app). I was 88th in my age group and 1,479th overall out of 1,829. I’m proud of the fact that I finished the race and was very happy to do it with such a great group of people. Following the euphoria of the finishing the race and spending some time thinking about my performance my thoughts haven’t been dominated by self-affirming resolutions about what I accomplished, instead my thoughts have been reviewing my diet, supplements and training regimen subconsciously developing a new program that will result in an improved result. I take that as a sign that running isn’t something I’m going to toss in the back of a closet like a pair of sneakers. And some how that makes me very happy! Misery is so close, it stands in the corner like a silent unwelcome guest, waiting for just the right moment to envelop me. But I do not let it, instead I cling to a very slim but painful hope. Race day is just two days away and I am ready. I started training for my first 5k the week before Christmas (about 16 weeks ago). I’ve logged more than 60 miles running in preparation for this race, I ran in snow, in rain and yes even dark of night to build up my strength and endurance to RUN this race. Race day is just two days away. 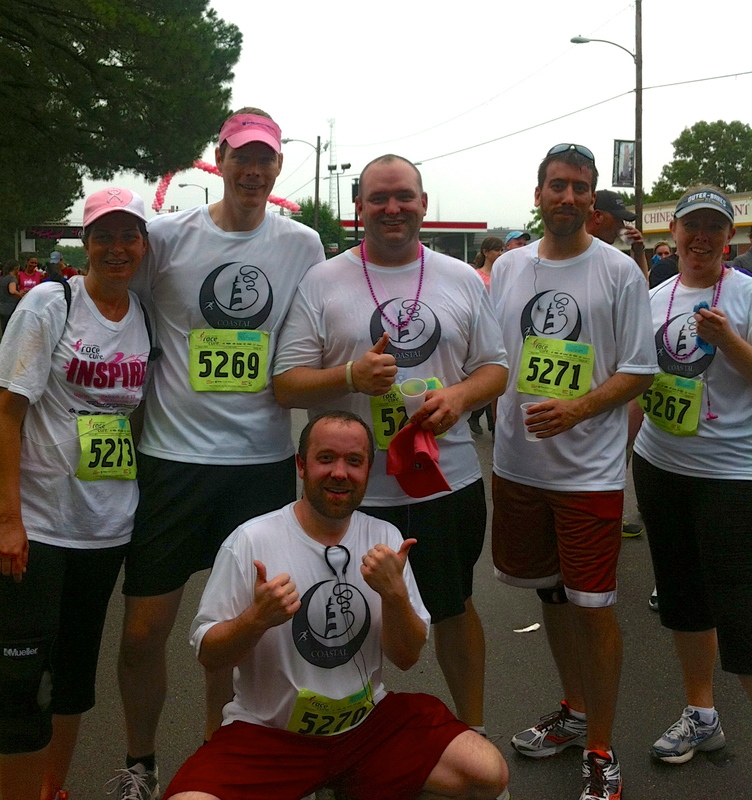 I recruited friends and co-workers to run with me, paid my fees and trained some more. I ran through an injury to my calf, ran at home, ran on business trips, and ran through the Vegas desert. I was ready to RUN this race. Last Saturday, I had a great 3.5 mile run in a local park. And on Monday I was doing 1/4 Mile speed work … things were humming. Then on Monday night, I started to feel a familiar tightening around my ankle … Gout. No problem, I said, I have medicine for that. Couple of pills and it will be gone in no time. But it wasn’t. By Tuesday it had locked it’s painful grip around my ankle and reduced my walking to peg-leg pace. I keep taking my medicine and supplements and it gets no better. I limped through Wednesday and Thursday drinking more water than should be consumable. But no improvement. Finally, go to the doc’s today and he acutely reconfirms, “You have gout!” and prescribes a new medicine. Probably too late for this race. Race day is two days away and I probably won’t be able to be there. All the work, all the miles but no payoff. My painful hope is that it will loosen it’s searing grip enough for me to walk on Race day, because I am a mere foot away from the goal line. I also take solace in the fact that there are 5k races almost every weekend in Raleigh and I will find one three or four weeks from now and will crush it! I am not discouraged, the finish line has simply been moved and I will work through this challenge as well, after all if it were easy everyone would do it. Ironically, the only shoe the doesn’t cause my left foot to scream in pain are the shoes I’ve used only to train for this race. Today, Lauren called and said she was having a problem with phone AND she couldn’t access the internet. I asked and she said she had already restarted the Cable Modem, So I called Time Warner Cable to see if there were any reported outages in the area. Not much more I could do from the office. I spoke to a lovely woman named Tameka who said there were not outages in our area, but she could see that the modem was not online and she offered to send out a tech. I asked to delay that request and that I would try to diagnose it when I got home. She even added that a loss of power on the modem would create the same condition. I thanked her and said I would call back as necessary. As of today I have completed run #2 of week 6 and am looking forward to finishing week six with an outside run this afternoon. Weeks 5 and 6 have really been great. The difficultly and self-doubt of weeks 3 and 4 are clearly behind me. I’m no longer using the C25K app when I run on the treadmill because the training intervals have become so long there is only one walk period in the whole workout. I’m also extending the workouts to longer periods. I’m completing a 5K each and every time I run now, that of course includes the warm up walk, the walking interval and the cool down walk. But hey 5K is 5K. My attention over the last four workouts has gradually evolved to be less concerned with finishing and more concerned about my time after finishing. I take this as a very good sign of my progress. As a part of that the Nike+ running app has become my go to training app although, I still use the training breakdowns in the other. But I know I still have a long way to go. I was doing my outdoor run last week for week five and “running” through my neighborhood when a young woman who was really running shot past me and down the street. She was flying! It was inspiring as it clearly showed there are a lot more I could look forward to even after finishing the 5K in April. I may be on week 6 but this is still just the beginning.